Bots provide answers, updates, and assistance in a channel. You can chat with them one-on-one or in a channel. They can help out with task management, scheduling, and more. Tabs help you share content and functionality from your favorite services in a channel. 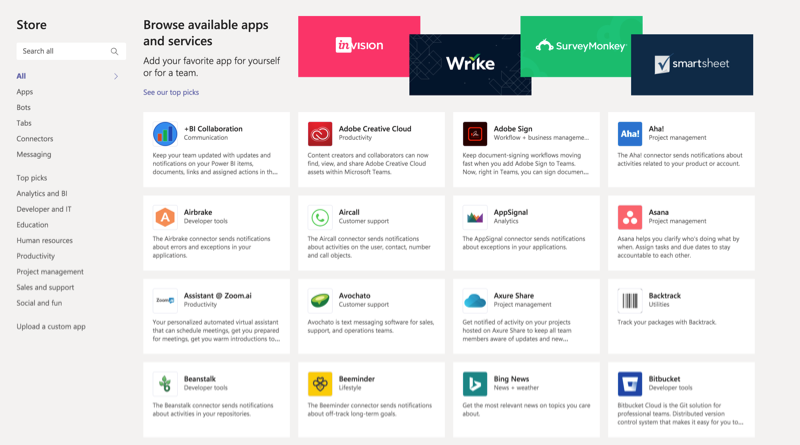 They can connect you to Microsoft services (like Excel or SharePoint), other services (like Asana, YouTube, and Zendesk), or a website of your choice. To open a chat while you're in a tab, click Show tab conversation at the top right-hand corner. Note: Tabs in channels can be seen by everyone on the team. Tabs in chats can only be seen by the people in that chat. Connectors send updates and information directly to a channel. Get automatic updates from your favorite services like Trello, JIRA, Twitter, RSS feeds, GitHub, and more. These apps find content from different services and send it straight to a message. You can share things like weather reports, daily news, images, and videos with anyone you're talking to. Messages sometimes include buttons for interacting with the app. For example, a daily weather report could include an option to download the forecast for the entire week. Go to the Store to add a bot, tab, connector, or messaging app to Teams. If you're interested, you can even build your own bot, connector, or tab. From your desktop or web app, there are a bunch of ways to bring your favorite apps and services into Teams. You can add connectors to channels, chat with bots, and add content and services directly to your tabs.